Got weeds? We can help control them on your property. Wildfires, overgrazing, transportation corridors and ATV trail travel encourages noxious weed infestations that affect rangeland, forested areas and--ultimately--property values. We collaborate with public agencies and form partnerships with private landowners to establish a higher and more effective level of week control in Teller and Park Counties. Need us to do your spraying for you? Click here for more information. Weeds can be managed several ways: biologically, chemically, culturally, and mechanically. Click on the button above view a copy of our Weed Management Preferences Guide. In it are suggestions for managing specific weeds--thistles and toadflax to knapweeds, spurges, and others. Teller-Park Conservation District makes every effort to assist landowners with weed management services. Each year, the district's board of supervisors sets aside a specific amount of money to help offset the cost of weed management services for private landowners. This year, the cost-share program provides a rebate for landowners up to 50% or $250 (whichever is greater) of their costs for spraying. This offer is only valid on spraying services provided by the Teller-Park Conservation District. 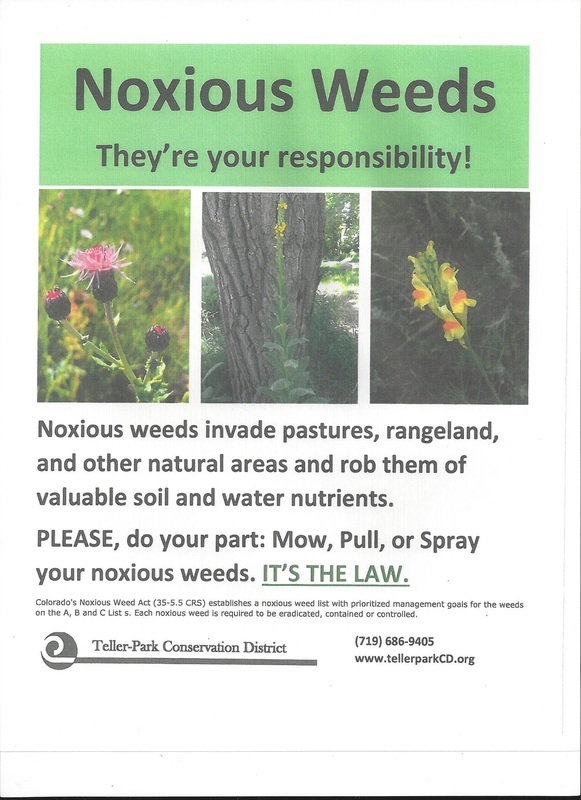 Weeds are classified by the State of Colorado as List A (most noxious), List B, or List C. Depending on the listing, noxious weeds are mandated to be eradicated, controlled, or contained. These are the most significant weeds in our two counties. Click on the links for datasheets prepared by the Colorado Department of Agriculture. If you want to spray your own weeds, we sell limited quantities of general use herbicides to landowners, such as Milestone or Telar. Our prices are competitive with other resellers' prices. We also have back pack sprayers you can borrow.